Hello, my name is Traci Yoshiyama, Zidisha’s Kenya Client Relationship Manager. I was welcomed into the town of Munanda today by Stephen Irungu, the proud owner of Irungu Modern Tailoring. It’s hard to miss his quaint shop, even amongst the many businesses blooming in the Munanda, for hanging on his door is a brown all-leather suit created by Stephen himself. In 2005, Stephen started Irungu Modern Tailoring with only one sewing machine. 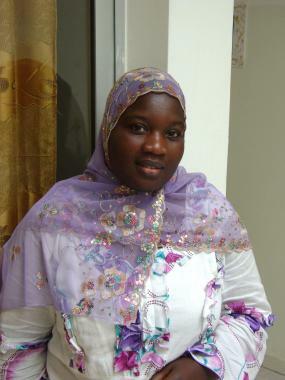 With this flourishing business, he now has three sewing machines, an iron, and also employs three people. It is also a family business, for his wife often times assists with the ironing. This is his second Zidisha loan and he plans on creating a boutique for the people of his village, the first of its kind in Munanda. 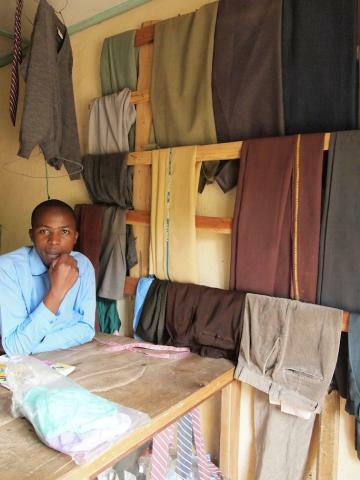 With the funds, he hopes to buy clothes from Nakuru and sell it in shop. His passion for fashion is evident, as he describes his store not merely as a job, but a hobby and his happiness. After my visit to his shop, Stephen kindly took me around his village, showing me various shops and introducing me to friends. He even assisted me in finding some much needed supplies that cannot be found in Mugaa, the village I am residing in. Best of luck with your loan Stephen. It was a pleasure meeting you.